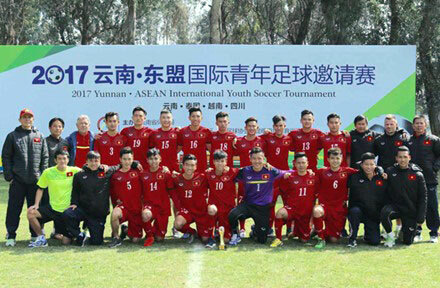 Vietnam came from behind to defeat Thailand 3-1 in the last match of the 2017 Yunnan-ASEAN International Youth Football Tournament for U19s in Kunming, Yunnan province, China on February 22. Thailand dominated the match early and opened the score in the 14th minute. Only four minutes later, Minh Di levelled the score at 1-1. The tie remained level until late in the second half, with Viet Cuong and Cong Minh scoring a quick-fire double in the 73rd and 78th minutes to secure the win for Vietnam. Earlier, Vietnam drew with Yunnan province 1-1 and lost to Sichuan province 0-1. The event provided Vietnam a chance to hone their skills for upcoming AFF U19 football events and the qualifying rounds of the AFC U19 championships./.